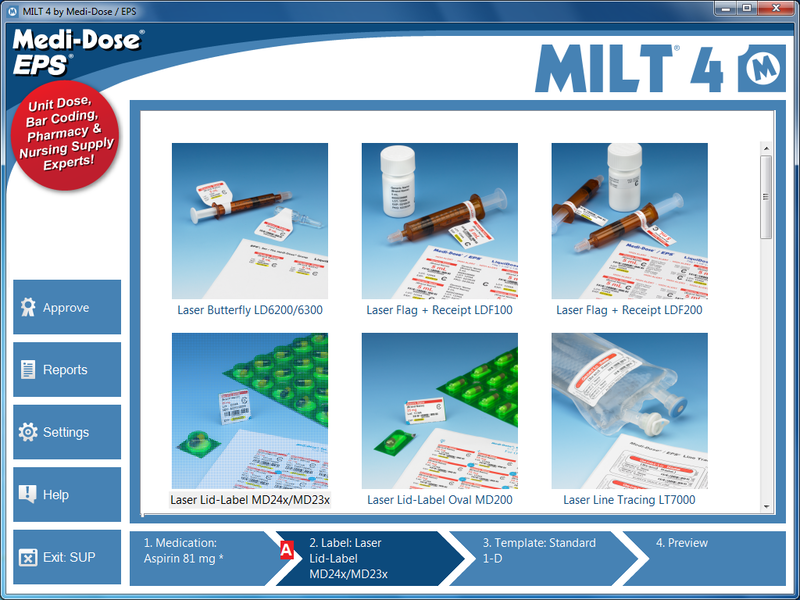 When you save a medication to your formulary MILT 4 will remember the Label and Template you like for that medication. Then next time a user picks that medication they can skip right to Step 4. Before we walk through the process, one quick note - Templates (Step 3) are like patterns that you use for many medications. The idea is to create consistent formats that are easy for staff and nursing to read. Most facilities only need one or two templates for each type of label. You should not need to make a special template for every medication. A The Medication tab is where you select, edit and then save medications to your formulary. B You can group and sort your formulary by up to three fields. Note how we are sorted by Generic and then Strength in the picture above. With these settings, all the “Aspirin” entries group together. When you click the plus sign (+) next to Aspirin you can select from the two different Strengths. C If the medication you want to package is not in the formulary you can manually enter the information in the fields or click the Find button where you can scan the bulk bottle bar code or type in text to search the included FDA NDC database. D Date calculations are performed each time a user picks a medication. The formatting shown on screen will be the formatting on the printed label. The selected date calculation will save with this medication and be recalled each time someone choose this medication from the formulary. E When you save a medication to the formulary it will also remember the type of label and the template you like for this medication. Each time a user picks this medication the correct label type and template will be selected also. A The Label tab is where you select a label type for your medication. If the label type you want does not appear, or there are label types you do not use and want to hide, go to Settings – Labels to turn them on or off. 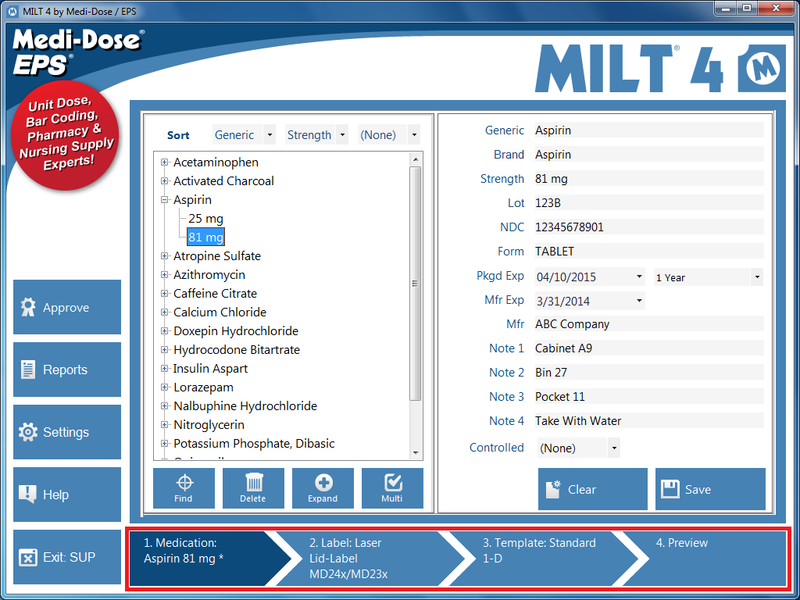 A The Template tab is where you select and edit a template for your medication. Templates are like patterns or layout designs that you use over and over for many different medications. Changes to a template will affect all medications that use that template. B Select a template from the drop-down list. C In the design area you can move and arrange items on the Dose and Log labels. 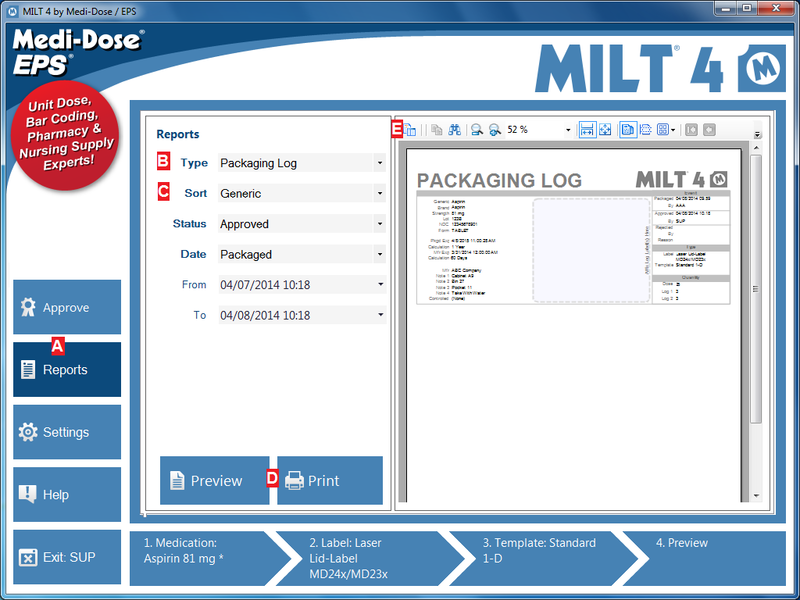 The log labels are typically used for your paper log book so users do not have to write the information by hand. E You can add Text Items, Bar Codes, Images and Shapes to your templates. F When you are done editing a template you can save it as a new template or overwrite the existing one. Remember that a template is going to be used for many medications. What you are saving is the layout of items and their formatting options, not the specific information for the medication you have open now. 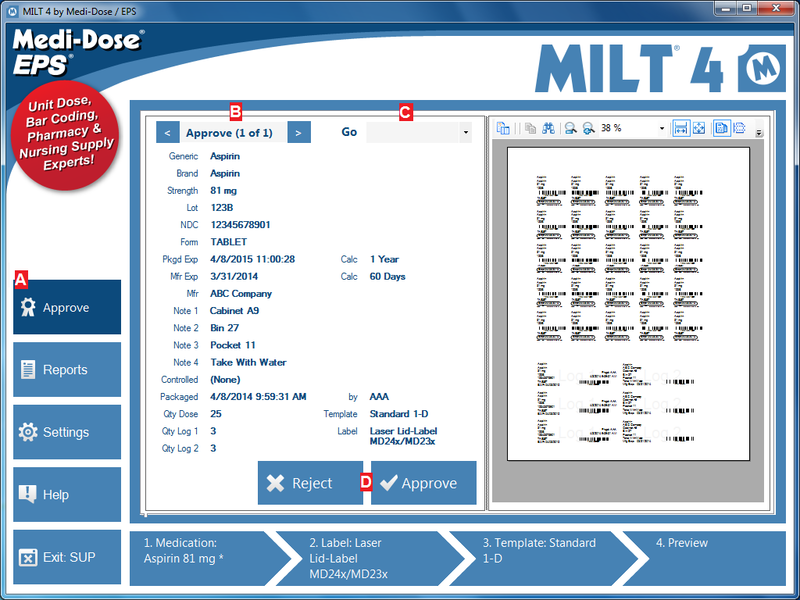 A The Preview tab is your final check before printing your labels. B Select a printer and tray here. 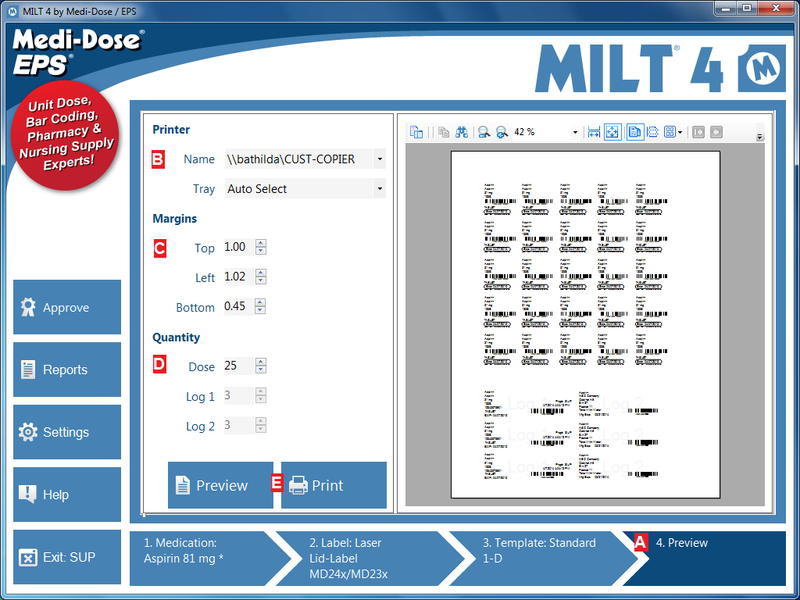 MILT 4 will remember these settings for this label type. C If needed, you can adjust the margins here. MILT 4 will also remember these settings. D Enter the number of Doses, Log 1 and/or Log 2 labels here. 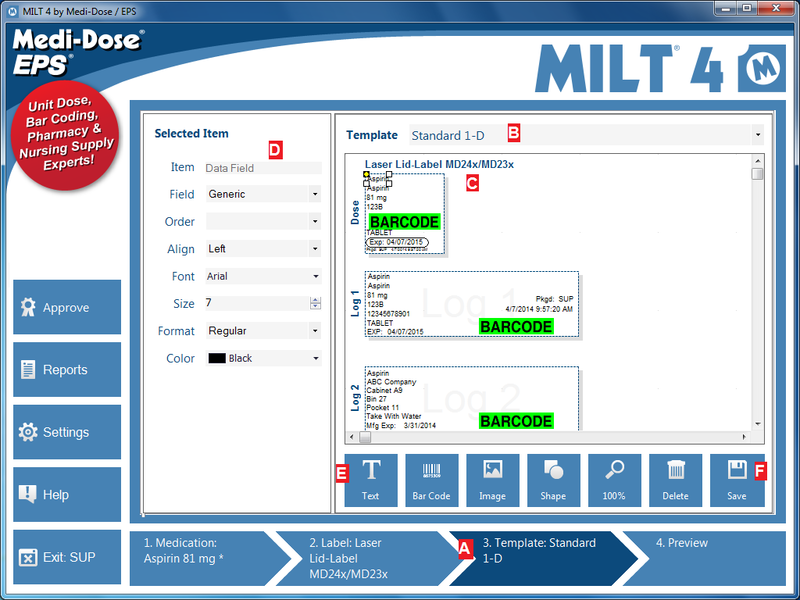 E Click Preview to see your label before printing, and then click Print if you are satisfied with the label. If you need to make changes you can go back to steps 1, 2 and/or 3 at any time. A Users who are allowed to view reports can click on the Report button. B Choose either Packaging Log or User Activity report type. C Enter the sorting and selection criteria. D Click Preview to view your report, and then Print to print a hard copy. E You can change the view options and search your report with the tools found here.